Seville has become in this period -and on numerous occasions- the seat of the Court, the key to this being its port and the Gualdalquivir river. Indeed, the river and the port impel a period of maximum splendor after the discovery of America in 1492. in 1502-1503 the Catholic Kings founded the Casa de la Contratación (The House of Contracts) in 1503, in the Royal Alcázares, in order to regulate trading relations and also judicial with America where they would contract and direct the journeys and control the riches brought from America, the New World. On the other hand, the Foundation of the Indian Consulate dates from the year 1543 which represents all non foreign merchants. Since the Consulate did not have its own headquarters, numerous merchantile treaties were conducted in the Cathedral, which forced the Ecclesiastical town hall to surround the temple with chains to prevent the traders and merchants from entering; these chains are still preserved. A solution is reached by the construction of the Casa de la Lonja, House of Exchange. Some time later Carlos III orders an adaptation to house the Archives of the Indies. All of this supposes for Seville a new and great urban expansion. At this time the work on the Cathedral continues or the dependencies (for example the "Patio de las Doncellas") of the Royal Alcázares which were remoduled on the occasion of the wedding of Carlos I and the celebrated Isabel of Portugal in 1526, as well as other sites: the House of Pilates, the House of the Dueñas, the Collegiate Church of El Salvadora nd the before named House of Contracts. And even more: thanks to the patronage of Catalina de Ribera, the Hospital of the Five Wounds is created, housing under one roof all of the sanitary venues in existence. 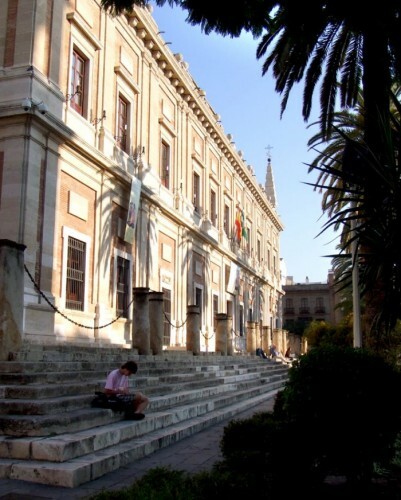 Also in the first years of the XVIth century the preoccupation of having a center of superior studies lead to the foundation of the School of Santa Maria of Jesus by Maese Rodrigo Fernandez de Santaella. This institution was the seed of the future Hispalense University. 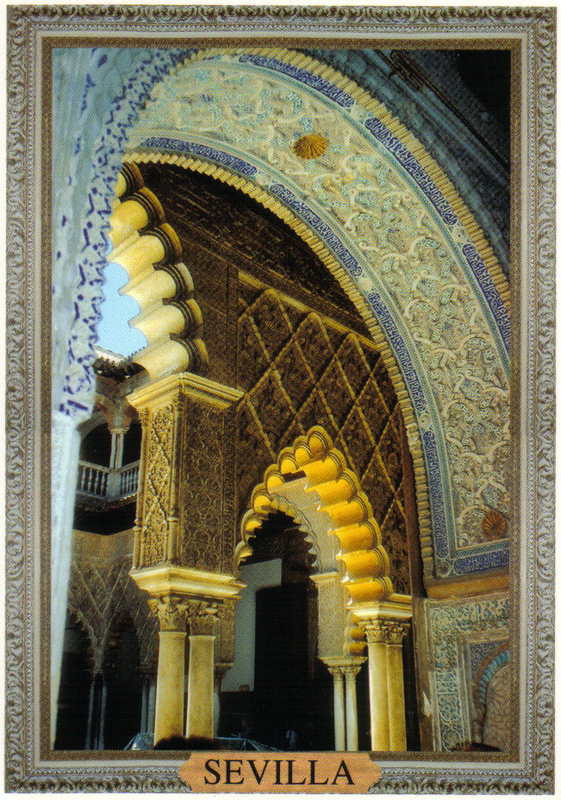 Seville in decadence, s. XVII and XVIII. In spite of the opulence enjoyed in the previous century, Seville in the XVIIth century was unable to avoid the serious economic crisis that affected Europe generall, and Spain, in particular. This decadence, agravated in this big city by frequent public calamities like flooding and a plague epidemic does not correspond however with a blossoming of culture and the arts. In this decline and decadence suffers even more by the move of the House of Contracts to the port of Cadiz, decreed by King Felipe V.
Seville transforms into a convent-city, which creates an ideal scenario for the consolidation of the penitential processions of Easter; after the Synod in 1604 the sevillians must attend by force the Santa Iglesia Cathedral (currently the "Carrera Oficial"). Seville earns the qualification "Land of María Santísima".